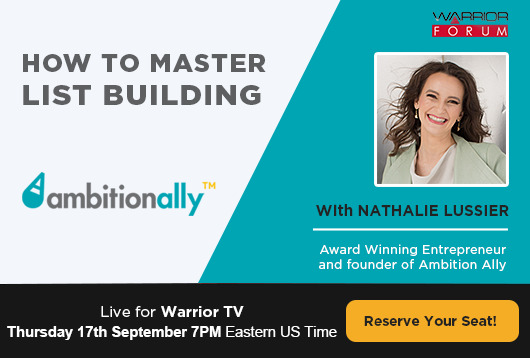 AmbitionAlly Founder Nathalie Lussier will join us at the next Warrior TV: Warrior Ask Me Anything event to share some actionable insights on how to master list building. Catch this event on Warrior Forum on September 17, 7PM, Eastern US time. Click to watch Nathalie’s video invitation. Nathalie started building websites at the age of 12 and later on graduated with a degree in software engineering. Right out of college, she built her own business after turning down a job offer from Wall Street. Nathalie, together with her husband Robin Li, founded AmbitionAlly where they build tools for business owners to use in growing their business. These tools -- WordPress plugins specifically -- are user-friendly, time-saving, and are ones that people don’t have to be tech geeks to administer. Aside from being an entrepreneur, Nathalie is a digital strategist and an international keynote speaker. She’s also a blogger who’s been helping out people improve online metrics like traffic, subscribers and sales. What most people admire about her is her ability to simplify the complex and make technology and marketing strategies easy to understand. Don’t forget to tune in on Warrior Forum this Thursday, September 17 at 7PM Eastern US time. Register to join this event and submit your questions for Nathalie. Sign up here for free. About Warrior TV: Warrior Ask Me Anything Events: Hosted by Warrior Forum,Warrior Ask Me Anything (WAMA) events are Q&A video interviews where the world’s top Internet Marketers and entrepreneurs share their strategies that have helped them become industry icons.